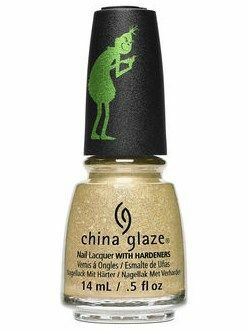 China Glaze Nail Polish, Merry Whatever, 1646, .50 fl. oz. Gold semi-sheer, jelly nail color mixed with holographic gold glitter and gold micro-glitter. China Glaze The Grinch Collection, Holiday 2018.